Government agencies trust RedSeal for mission-critical security and compliance. Perhaps more than anyone else, government agencies require the highest level of mission-critical security and compliance. Our government security and compliance solutions are trusted and operational across the Department of Defense, civilian agencies, the intelligence community and state and local governments across the country. Our cybersecurity platform is Common Criteria certified and supports US Federal Common Access Cards (CAC) for two-factor authentication. And, you can manage RedSeal on an IPv6 network. Increase network resilience with RedSeal across the DoD by enabling proactive defense and predictive analysis along with DISA STIG compliance. Find out how. RedSeal is a must-have tool to implement CSIP in your agency this year. Find out how. RedSeal enables the Intelligence Community to effectively secure the complex, dynamic networks that protect access to critical information and systems. Find out how. 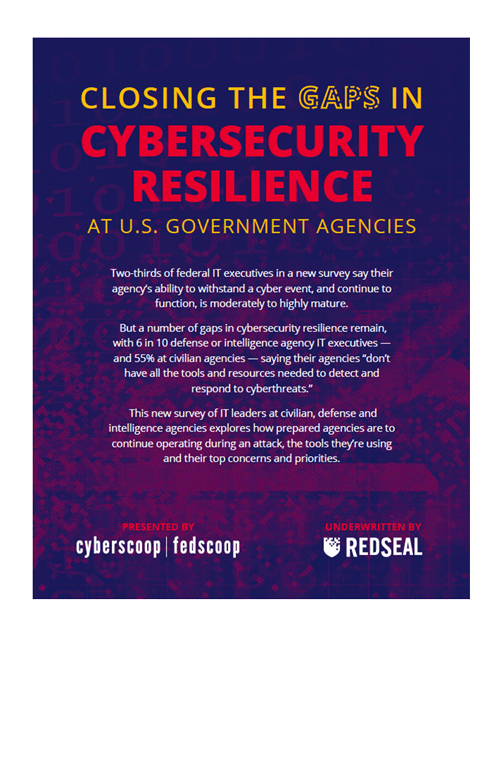 RedSeal helps state and local governments with their number one IT priority — cybersecurity issues caused by a lack of digital resilience. Find out how. Read white papers, listen to webinars, and learn more about RedSeal’s approach to digital resilience to see how we fit into your cybersecurity stack. Learn more. We have a robust team of partners across federal, state and local levels of government. Learn more.